Cook the asparagus spears and green beans in one inch of salted boiling water, covered, for 3-4 minutes. Drain and cool the vegetables and arrange them on a serving plate. Combine the dip ingredients in a small bowl and garnish with sprigs of parsley and tarragon and set dip along side vegetables on serving dish. In Recipes-list.com we have selected the most viewed recipes from category - uncategorized . Enjoy the best recipes specially selected for you! 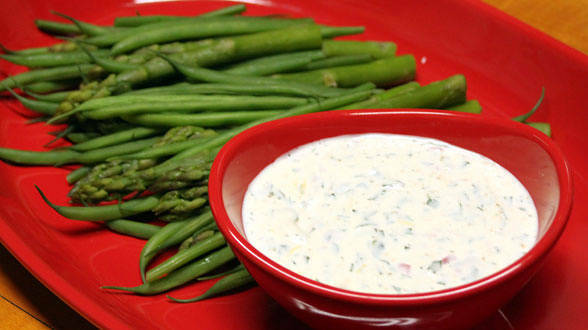 Asparagus and Green Beans with Tarragon Lemon Dip is the right choice that will satisfy all your claims.